Family Photos Hidden away in albums and boxes are our precious memories of family members and friends. 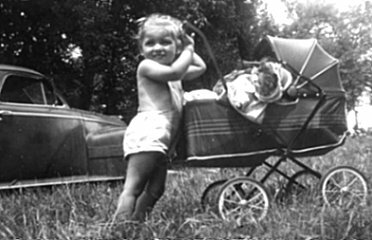 Many are snapshots from forgotten holidays and outings capturing images of our children holding their dolls. 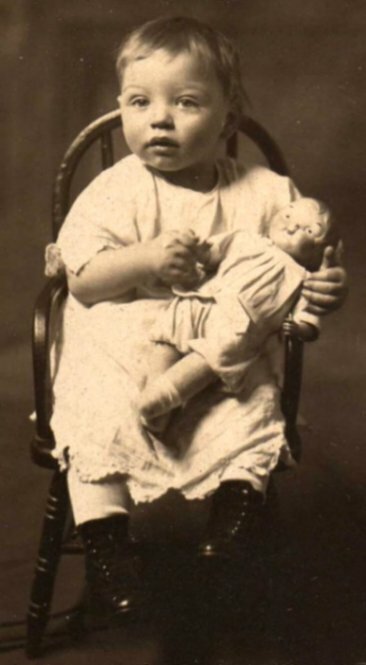 Some are posed studio portraits of an apprehensive child holding a baby doll or toy meant to calm their fears as well as to enhance the image. Below is a picture of my great uncle, Frank. I did not have the pleasure of knowing him except stories passed along by family. He was among those very young victims of the 1918 flu epidemic. Uncle Frank and an early Campbell Kid doll. The doll has a composition head with a cloth firmly stuffed body. Now, I know this was a studio plant to appease him, as he would never have touched a doll otherwise. A picture of my father, Victor. He did not have a doll. He was one. The advance in technology has offered the advantage of instant color copy machines which are available in many easy to access locations. 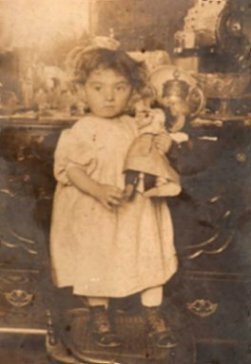 Antique and older photos can be duplicated at a minimal cost, so don't hesitate to ask family, friends, and associates if they have any pictures of children holding dolls that they will allow you to borrow. 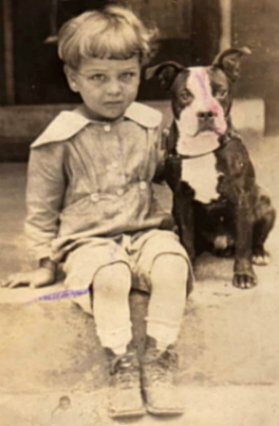 I have spent much time visiting swap meets, yard and garage sales, Antique shows and malls---some of my favorite finds are vintage photos of unknown family members holding period dolls in unique settings. Welcome to "Show and Tell" for Pictures of Family with Dolls! We all love to share. If you have photos and information pertaining to early family pictures with Dolls, please fill in the form below to "Show and Tell" your favorite family pictures with Dolls. We all have interest in when they were taken, what kind of doll, any history behind the image and the doll, and anything else you would like to share with other avid collectors.